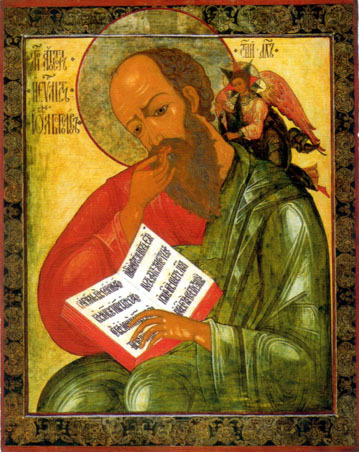 Passing of the Holy Apostle and Evangelist John the Theologian – Sept 26. Troparion (Tone 2): O beloved apostle of Christ our God,* hasten, deliver a people without defense. * He who received you when you leaned upon His breast accepts you as you bow in prayer. * Implore Him, O Theologian, to scatter the cloud of nations that besets us,* asking peace and great mercy for us. Kontakion (Tone 2): O virgin apostle, who can recount your mighty works? * For you pour out wonders and healings* and you pray for our souls as Theologian and friend of Christ. Epistle: (1 John 4:12-19): Brethren, no one has ever seen God; if we love one another, God lives in us, and his love is perfected in us. By this we know that we abide in him and he in us, because he has given us of his Spirit. And we have seen and do testify that the Father has sent his Son as the Saviour of the world. God abides in those who confess that Jesus is the Son of God, and they abide in God. So we have known and believe the love that God has for us. God is love, and those who abide in love abide in God, and God abides in them. Love has been perfected among us in this: that we may have boldness on the day of judgement, because as he is, so are we in this world. There is no fear in love, but perfect love casts out fear; for fear has to do with punishment, and whoever fears has not reached perfection in love. We love because he first loved us. verse: God is glorified in the council of the saints, great and awesome over all those around Him (Ps 88:8). Gospel: (John 19:25-27; 21:24-25): At that time, standing near the cross of Jesus were his mother, and his mother’s sister, Mary the wife of Clopas, and Mary Magdalene. When Jesus saw his mother and the disciple whom he loved standing beside her, he said to his mother, ‘Woman, here is your son.’ Then he said to the disciple, ‘Here is your mother.’ And from that hour the disciple took her into his own home. This is the disciple who is testifying to these things and has written them, and we know that his testimony is true. But there are also many other things that Jesus did; if every one of them were written down, I suppose that the world itself could not contain the books that would be written.